Tuesday | January 17, 2017	Bakerzin’s award winning Original Pineapple Tarts have been winning accolades after accolades, year after year, with highlights including Top 3 Yummiest Pineapple Tarts by The Sunday Times, 6 Best Pineapple Tarts in Singapore by Silverkris, inflight magazine of Singapore Air and Top 8 Best Pineapple Tarts by HardwareZone.com in the year 2015 and 2016 respectively. 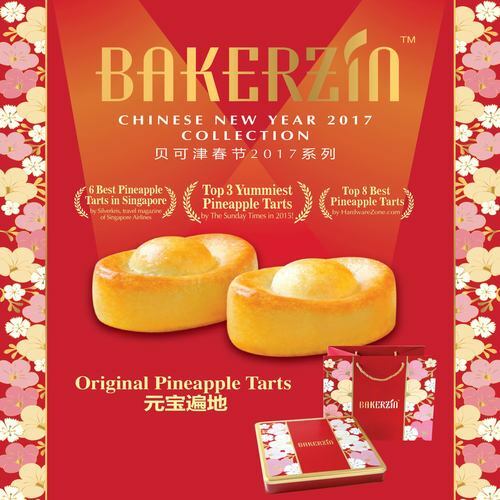 The fragrance of the butter gives this quintessential delicacy its smooth luxurious texture, ansd each bite of the pineapple tarts gives a robust flavour. Premium butter is selected for use in the pastry which our customers are familiar with and the homemade pineapple jam (a decade-old recipe) is cooked to perfection with hints of cinnamon and cloves. This year sees more accolades awarded, Best Pineapple Tarts of 2017 in Singapore by the Honeycombers, Top 2 Best Pineapple Tarts of 2017 in Singapore by TimeOut Singapore and 10 Most Addictive Chinese New Year Snacks of 2017 by Yahoo Singapore. With the above accolades, definitely affirm our brand presence and foothold in the food and beverage industry in Singapore. Sink your teeth into one of our very best Original Pineapple Tarts to attest the accolades given to us by our critics and media. Head on down to any Bakerzin outlets to place your orders at least 1 working day in advance! Last day for collection at outlets and delivery on 26 January 2017. Bakerzin has additional 4 booths in operations as well; Chinatown Point and Jurong Point available now & AMK Hub and Northpoint from 16th January 2017 onwards. You may, alternatively, purchase online as well! With the above several options, this is your final golden opportunity to hit on our pineapple tarts!